After a widely celebrated end to 2016, the Golden Globes are a highly anticipated jump-start to not just a new year, but also the 2017 Awards Season. On the red carpet last night, the prevailing trend came in the form of gowns adorned with gold and silver sequins. Perhaps in a desire to cling to the last of the celebratory holiday season, or as a beacon of hope in an unknown new era, several stars picked glimmering gowns. Drew Barrymore's whimsical Monique L'huillier dress had angelic off-the-shoulder wing sleeves. Marchesa's high-neck, belted and tiered metallic gown accentuated Chrissy Teigen's figure. Emma Stone was a contender for best dressed in this pale Valentino gown embellished with -what else?- stars! Alexander McQueen's feather-hem gown has a stunning sequin pattern that creates the look of an ocean's wave on this gorgeous gown. The rock-star wrist embellishments add a cool edge but the puff sleeves might be best left for runway presentation. Ruth Negga is one of my favorite new red carpet ingenues. Her custom silver Vuitton gave off elevated athleisure cool on the bodice with a crew neck and mid-arm sleeves. Marc Jacobs designed a sparkling, open-back gown with long sleeves that matched perfectly with the Golden Globe statue that Sarah Paulson won! 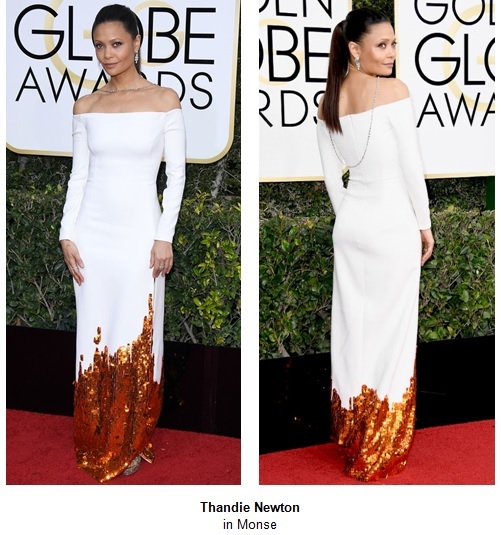 My favorite, best-dressed of the night went to Thandie Newton, who took the sequin motif and turned it on it's head! Instead of an embellished bodice or choker, or allover pattern, she chose a stark white, off-the-shoulder Monse dress dripped in sparkling copper at the base. Paired with a reverse drop Harry Winston diamond necklace, she exemplified how to take the sequin trend to a bold new level. Sequins can go beyond just the holiday season and can add a statement to any outfit. Do these looks inspire you to embolden your next night out with some sparkle?